Seeing as St Patricks Day is here, I decided to bake some festive cupcakes using Baileys Irish Cream, Irish whiskey and chocolate gold coins. 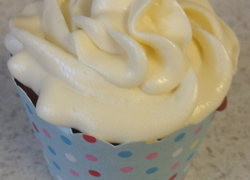 My Baileys and Irish Whiskey Cupcakes are basically a boozy food cocktail! In a medium sized heat proof bowl place the chocolate and cream and heat in the microwave for 30 second intervals until melted. Whisk in the whiskey and place in the refrigerator until needed. Preheat 180 degrees C and line two cupcake trays with 30 cases. In a medium sized bowl bowl mix together the flour, baking powder and cinnamon. In a large bowl, beat the butter and the sugar together until it's light and fluffy. Beat in the eggs one at a time until combined. Mix in the vanilla. Add the flour mixture in 3 additions, alternating with 1/2 cup of Baileys, starting and ending with the flour. Fill the cupcakes cases 2/3 full and bake 15-20 minutes or until golden. Using a tooth pick, poke holes through the cupcakes. With a pastry brush, brush the cupcakes with the remaining Baileys. In a large bowl place butter, icing sugar, food colouring and cinnamon and beat until fluffy. Alternate adding and beating in the Baileys and cream until the buttercream is the desired consistency and taste. Frost the cooled cupcakes using a star tipped piping bag. 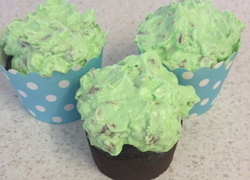 Using a spoon, drizzle the chocolate ganache over the cupcakes. 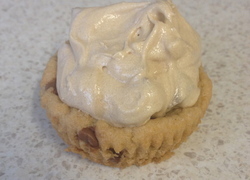 Place one of the chocolate coins in the centre of the buttercream icing.